Our November WiN meeting will be held Thursday, November 7th at the Community Care Village Housing Building (click on the link at the right for map and directions). 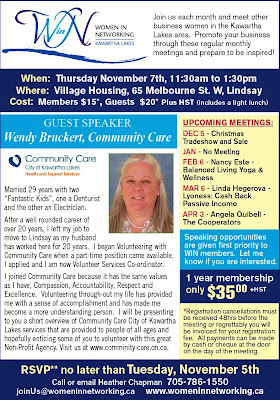 Wendy Bruckert of Community Care will be our guest speaker and the wonderful Edna Smith will be catering our delicious and healthy lunch. Full details below. Please let me know by email if you are planning to attend.